For better or worse, pets often serve as inspiration and test subjects for hardware hacks: smarten up that hamster wheel, tweet the squirrel hunting adventures from a dog’s point of view, or automate and remote control a reptile enclosure. [TheYOSH], a gecko breeder from the Netherlands, chose the latter and wrote TerrariumPi for the Raspberry Pi to control and monitor his exotic companion’s home through a convenient web interface. The right ecosystem is crucial to the health and happiness of any animal that isn’t native to its involuntarily chosen surroundings. Simulating temperature, humidity and lighting of its natural habitat should therefore be the number one priority for any pet owner. The more that simulation process is reliably automated, the less anyone needs to worry. TerrariumPi supports all the common temperature/humidity sensors and relay boards you will find for the Raspberry Pi out of the box, and can utilize heating and cooling, watering and spraying, as well as lighting based on fixed time intervals or sensor feedback. It even supports location based sunrise and sunset simulation — your critter might just think it never left Madagascar, New Caledonia or Brazil. All the configuration and monitoring happens in the browser, as demonstrated in [TheYOSH]’s live system with public read access (in Dutch). It only seems natural that Python was the language of choice for a reptile-related system. On the other hand, it doesn’t have to be strictly used for reptiles or even terrariums; TerrariumPi will take care of aquariums and any other type of vivarium equally well. After all, we have seen the Raspberry Pi handling greenhouses and automating mushroom cultivation before. For some of you the title might seem familiar, as [Patrick Van Oosterwijck] LiFePO4wered/Pi project is a quite successful Hackaday.io project. Now he’s designing from scratch the plus version to fill in some gaps and solve some of the challenges that affected the initial project. So what exactly is LiFePO4wered/Pi+ and what can it do? In a nutshell, it’s a smart UPS for the Raspberry Pi. The standard version allows a Model A+ and Pi Zero to run on battery for over 2 hours, and the B+, B2 and B3 to run for at least an hour (it maybe less, depending on the system load, of course). It implements two-way communications between the power system and the Raspberry Pi (running the open-source daemon) over the I2C bus. This allows for continuous measurement of the battery voltage and load voltage, with user programmable thresholds for boot, clean shutdown and hard power down. There’s a touch pad that provides clean boot/shutdown capability even in a headless setup, a wake timer allowing the Raspberry Pi to be off for low duty cycle applications and an auto-boot feature to maximize uptime by making the Raspberry Pi run whenever there is sufficient battery power. That’s the standard version, which we covered last year… what else could the plus version have? Well, to start, it brings more current to run complete systems with LCD screen and hard drives, the previous version was limited when it came to current. It will provide the option for a wider range of input power sources, such as solar panels, which is pretty nice. The on/off button and the power led will no longer be soldered on the main board so they can ‘relocated’ elsewhere, for example, when making a custom enclosure. Detection of input power to trigger automatic boot and shutdown will be added and last, but not least, a real-time clock with absolute time wake up. So there it is, the new LiFePO4wered/Pi+ version, with all bells and whistles for the Raspberry Pi enthusiast. There’s no piece of technology that has been more useful, more influential on the next generation of sysadmins and engineers, and more polarizing than the Raspberry Pi. For $35 (or just $5), you get a complete single board computer, capable of running Linux, and powerful enough to do useful work. For the 2016 Hackaday Prize, [Arsenijs] has created the perfect Raspberry Pi project. It’s everything you expect a Pi-powered project to be, and more. While the Raspberry Pi, and the community surrounding the Raspberry Pi, get a lot of flak for the relatively simple approach to most projects which are effectively just casemods, critics of these projects forget the historical context of tiny personal computers. Back in the early ‘aughts, when Mini ITX motherboards were just being released, websites popped up that would feature Mini ITX casemods and nothing else. While computers stuffed into an NES, an old radio, or the AMD logo are rather banal projects today, I assure you they were just as pedestrian 15 years ago as well. Still, the creators of these Mini ITX case mods became the hardware hackers of today. It all started with simple builds, a Dremel, and some Bondo. [Arsenijs] takes his Raspberry Pi project a bit further than a simple casemod, drawing influence from a Raspberry Pi smartphone, a Raspberry Pi security system, a Portable Raspberry Pi, and a Raspberry Pi wrist computer. These are all excellent projects in their own right, but [Arsenijs] is putting his own special twist on the project: he’s using a Raspberry Pi, and a few Raspberry Pi accessories. While this project is first and foremost a Raspberry Pi project, [Arsenijs] isn’t limiting himself to the platform with the Broadcom chip. The team behind this Raspberry Pi project was busy porting the project to Odroid when the Banana Pi came out. This changed everything, a refactor was required, and then the Orange Pi was announced. Keeping up with technology is hard, and is a big factor in why this Raspberry Pi project hasn’t delivered yet. You can say a lot of things about the Raspberry Pi foundation, but at least their boards make a good attempt at forward compatibility. Already [Arsenijs]’ Raspberry Pi project is one of the more popular projects on Hackaday.io, and is in the running for being one of the most popular projects in this year’s Hackaday Prize. Whether that popularity will translate into a minor win for this year’s Hackaday Prize remains to be seen, but it seems for [Arsenijs] that doesn’t matter; he’s already on the bleeding edge of Raspberry Pi projects. USB On-The-Go (OTG) is one of the fun aspects of the USB standard. There are feelings about the other aspects, but that one is alright. Regardless, [Francesco] realized one day that the £3 digital picture frames he purchased at a charity sale really didn’t care if the files on the thumb drive mysteriously changed all the time. It would just keep pulling and displaying the latest file at a blistering 0.2 frames per second. That’s right, the concept [Francesco] went after is to show changing data, even animations, with an update of one frame every five seconds! His initial tests showed good for the concept — the Pi can easily emulate a mass storage device, feeding in data whenever the picture frame looks for it. In addition to the Pi Zero board he added an Ethernet shield, a voltage regulator, a camera, and even some infrared LEDS. We suppose there are dreams for the future. He has been developing scripts for this rig by logging in through a VNC. A cron job runs his scripts at regular intervals, grabbing useful data and making it available as an image. 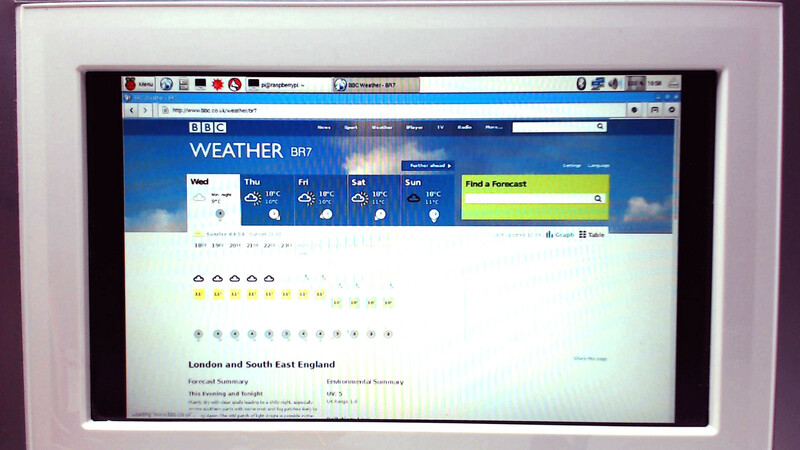 For example, one script opens up the weather in Epiphany (a web browser), takes a screenshot, and saves that screenshot to the mass storage being emulated using USB OTG. The digital picture frame blissfully updates, unaware of its strange appendages. Now the real limiting factor is how much you can accomplish with your mad Bash skills. [ModPurist] sent us his Raspberry-Pi-in-a-Nintendo casemod. Before you go hitting the back button, this is a good one because it’s so well executed. And it’s actually a two-fer: he’d previously built up a wireless NES controller that completes the setup. Both of these mods are hacks in the purest sense of the word. 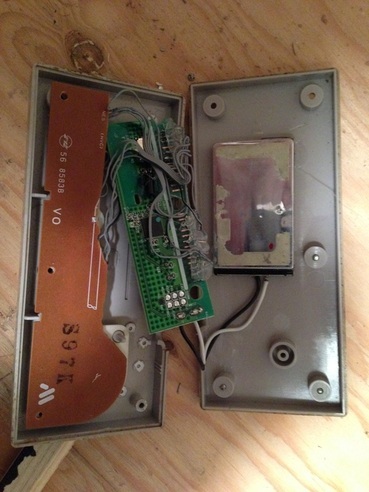 The controller mod took a wireless keyboard’s sending circuit board and wedged it inside the NES controller. The original NES controller reads out the buttons into a shift register and sends that down a wire. That’s all gone. [ModPurist] just wired up each button to the sender PCB and figured out which keys they corresponded to on the PC by pressing the buttons. Simple. The best part of his video about building the controller? After about a minute in, he forgets that he’s filming a technical how-to video and plays Pokemon for the remaining four minutes. That’s the sign of success. Then there’s the NES hack itself. He stripped everything out, added a Raspberry Pi 2 and a fan, made it all work with the power switch and the original TV outs, and it’s done. Again, nothing more than needs doing, but nothing less. It looks just right plugged up to the CRT monitor (from a C64, no less), and there’s no doubt that being able to play wirelessly on an original NES controller is cool. This isn’t [ModPurist]’s first time here on Hackaday either, and his “Cold Boy” fridge-turned-Gameboy is a work of art. It’s not the biggest use of a Raspberry Pi, but running emulators for old game systems is by far the most visible use of the Pi. In fact, putting Pis inside old game systems has led to a resurgence of case modding not seen since the heyday of the Mini-ITX craze of the early ‘aughts. You’d think every possible Pi casemod had been done by now, but [frostedfires] is still raising the bar with a Pi casemod that stuffs a clone of everyone’s favorite credit card sized computer into a Game Boy Advance SP. [frostedfires] isn’t using a real Raspi from The Foundataion. Instead, he found the Odroid W, a raspi compatible board that’s about half the size of a model B. It still has everything needed to complete the build – analog video out, a reasonable Linux system, and enough processing power to run Quake III. Right now, [frostedfires] has the screen working – that was taken from a car backup camera. Other than that, the only portion of the build left to go is a few buttons. This is officially the smallest derivative casemod we’ve ever seen. the previous record holder was the still tiny Game Boy Pocket build from last summer. That build required heavy modifications to the Model B board, though, so if you’re aiming for a smaller build, the Odroid is the way to go. Thanks to the Bacman forums for yet another great build. [Gert van Loo], the person who designed the alpha hardware for the Raspberry pi model B, has put out an expansion board for the Raspberry pi that we think many of you might be interested in seeing. Dubbed the Gertboard, this expands the Raspi with some GPIO goodness. We have seen TONS of tutorials for the Raspberry pi, and a few projects as well. We’re hoping that we’ll start seeing more projects where the Raspberry pi is the brain, but only part of the project, start becoming more frequent. The board is pretty cool, now lets see what you guys can build with all that power!